Today we’d like to introduce you to Ray Binkowski. Ray is a former fat guy that has lost 60 lbs. and kept it off for 20 years. Ray has a degree in Mechanical Engineering and worked in that field for some time. In his free time he helped others struggling to lose weight and get healthy. This lead to the starting a training business and then the purchase of a health club. In addition he is an author, blogger, promotes two fitness contests and even had his own radio show. In an effort to share a simple approach to making better food choices he wrote Eat by Color. 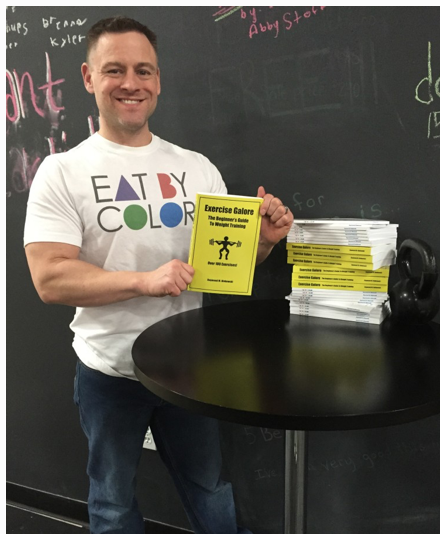 Eat by Color is available in print and e formats on Amazon.com. Eat by Color codes type of food by color and makes eating to lose and maintain weight as simple as children’s paint by number. The third title Exercise Galore, The Beginner’s Guide to Weight Training is a how to weight train. The book is intended to be read in digital format like that of a Kindle as there is a video for each exercise. In addition, readers learn how to build in a plug and play fashion their own result producing workouts. In addition to books he has written and ghost written articles for magazine and other print mediums. Ray owns Fitworkz a 24-7 hybrid training gym. The 15,000 square foot facility is located in Northern Illinois. FitWorkz is a hybrid training gym offering cardio, machines, and free weights including 4 sets of dumbbells, squat racks and more! Plus there is over 3,000 square feet of functional training space offering bumper plates, Rogue rack, tires, kettlebells, TRX and MORE! It is open 24-7 and is located in Northwest Illinois in DeKalb. He has consulted and trained military, law enforcement, tactical entities, professional athletes, pageant winners, Blue Chip companies, and people from all walks of life to optimizing their physical readiness and capabilities. Since 2005 Ray has promoted the OCB Midwest States one of the country’s largest 100% drug tested and natural physique contest. Competitors from all over the world have competed in categories like bikini, figure, physique, and bodybuilding. On YouTube Ray has shared his experience, tips, advice and other tools to help people reach their goals. To date there are over 1500 videos on his YouTube channel youtube.com/fitworkzdekalb. After requests to make content portable he started turning his content into video and audio podcasts. On Get Fit and Live Healthy with Raymond Binkowski contact becomes portable. Plus if you dig deep in the pod casts you will find some of his radio shows content. Life is never a smooth road. There are always obstacles and opportunities. When I started my training business I had known idea where to even start. At this point in my life I was still working full time. I knew I wanted to help people AND that I wanted to own my own business. So I asked the few people I knew that owned a business. I even went so far as to ask the president of the company I was employed by the best route to become a business owner. This taught me what questions I did not even know to ask and where I could find the answers. No matter the industry and obstacle everything comes down to people. It is amazing what just asking will do. Most people just are not willing to go ask questions though. I started my training business and asked the owner of the local gym if I could train his members. So I would stop in and ask periodically…. Then I asked a friend if he know the owner….and if he would put in a good word or ask for me. My friend did and next thing I knew I was set up to meet the gym owner. Interestingly enough I had asked the better part of a year before this. When I finally sat down to talk with the gym owner he said he was going to retire some time sooner than later and that I could rent office space and train while we got to know each other. Then maybe one day he would sell me the club. Well that is not what initially happened. Initially, the owner changed his mind and said it would be a few years before he was ready to sell and retire. Every one to two months I would ask the owner to lunch. At lunch I would ask if he was ready to sell me the club. His answer was no…And we would order food and eat. It took more than five years before I got a yes…and to be honest I almost gave up. Again, regardless of challenge or industry… leverage the network of people you know, ask questions and be persistent. Eat by Color and FitWorkz – what should we know? What do you guys do best? What sets you apart from the competition? Our club has been open for 4 decades. In the words of our members and clients… we can. Rather than rent access to equipment we provide the service and accountability that people need to reach their goals in the world of health, wellness and weight loss. Watching our clients crush their goals and change their lives. As I am writing this I had two members/clients step into my office to ask questions and share their progress. One is down tens of pounds and numerous dress sizes…. The other has cut her dress sizes in half….best part… she is middle aged! Watching former employees and interns go on to do amazing things helping others using some of the tools they learned here working for us. Last week we got an email from a former intern that just got a job as a manager in a fitness facility… he said it was because of his experience here. In May another was posting pictures of her graduation from a Doctor of Physical therapy program. Or the former employee that is finished residency in Chicago that we helped transition from athlete to trainer to med school.